In September 2017, Hurricane María - a category 5 hurricane - was the strongest storm to make landfall on the island of Puerto Rico in over 80 years with wind speeds that reached 175 mph. This terrible storm went through the center of the island, causing immense damage, including loss of communications and electricity, coastal flooding, flash floods, mudslides, and damage to infrastructure estimated at an upwards of $15 billion in losses. In addition to the problems Puerto Rico is suffering as a whole, the Concilio de Puerto Rico – the local Boy Scout council on the island – is dealing with a number of different issues. As a result of the storm, Puerto Rico Service Center sustained damage to the roof and air conditioning system. The interior of the office also sustained considerable water damage. It will be a long time before repairs can be made and electricity restored to the office. Due to this delay, it will be many months before the council can begin anything considered normal operations, and it will most likely be many months more before the Puerto Rico community is in a position to begin supporting the council financially. Funds to operate and rebuild the council during this timeframe will, therefore, be a real concern. The council’s beloved Camp Guajataka also suffered the onslaught of Hurricane María. Campsites were flooded with over 3 feet of water. Many trees have fallen, making transportation and recovery operations at the camp difficult. The camp has no electricity, except for power generators running on diesel (which is now an expensive commodity), and running water is hard to come by. All of the camp’s buildings were damaged by flooding. Camp has no electricity or water. It would appear that all of the equipment stored in the campsites such as bunks and mattresses were damaged. 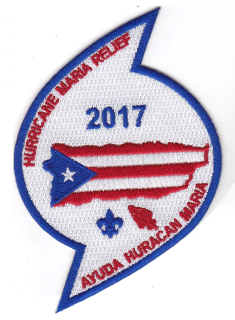 In response to this disaster, the Northeast Region Chief and OA Chairman, as well as the Northeast Region Area 5 Director, have tasked Section NE-5 (of which the Logia Yokahú and Concilio de Puerto Rico are members) to create a patch set to commemorate the recovery effort and help raise necessary funds that would assist in ensuring Scouting in Puerto Rico gets up and running again. Proceeds of patch sales will go toward Scouting’s recovery effort on the island.